Happy Wednesday! 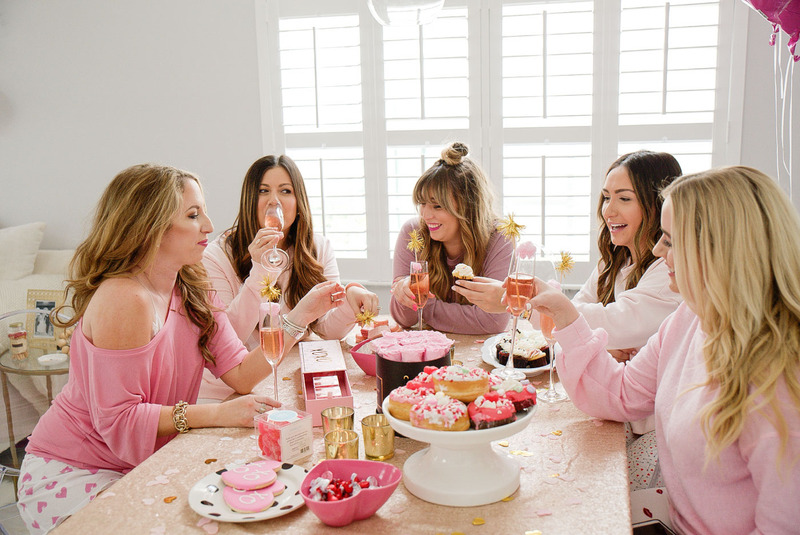 I’m super excited about this post because it’s all about how to make the best of Galentine’s with your closest gals. Don’t get me wrong, I love Valentine’s Day. 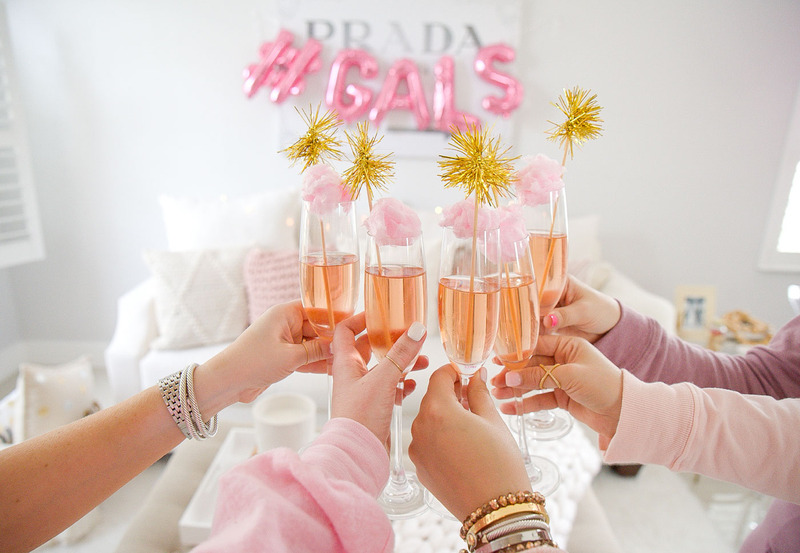 But I don’t have a boyfriend and, even if I did, I love to spend to spend a day with my friends enjoying all things pink, bubbly and girly. 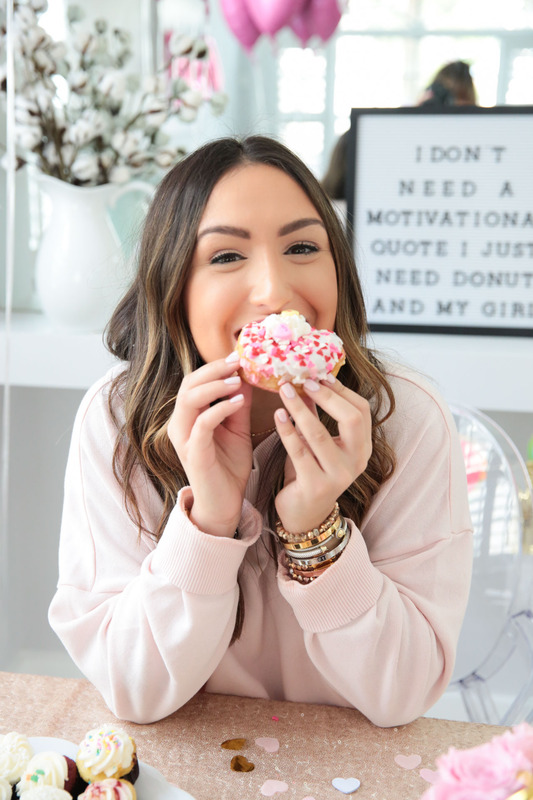 This past weekend, some of my favorite Florida bloggers (Stephanie, Kristin, Jaime and Nina) and I got together to celebrate Galentine’s Day and I wanted to share some tips on how to make the most of your Galentine’s Day gathering! I’ll link details for things as I go so make sure to scroll through to get the whole rundown! 1. 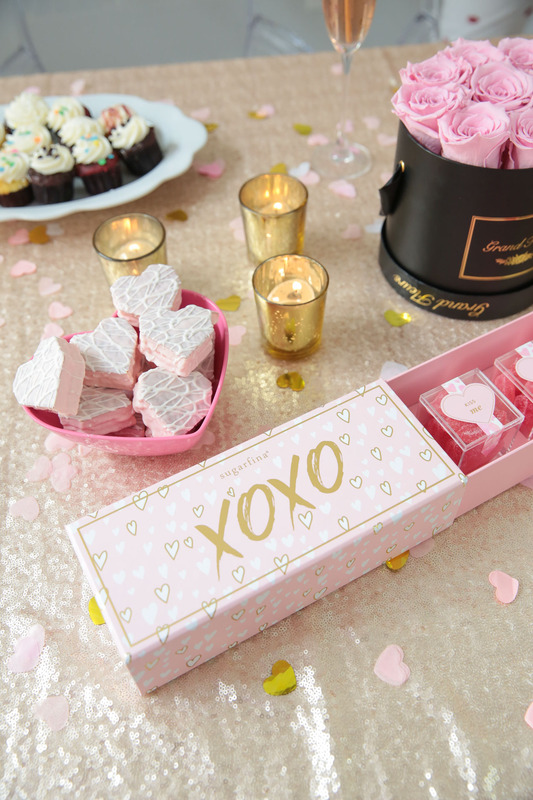 Get cute decor and yummy snacks! It’s all about decor. Kristin has a gorgeous house so it was easy to bring in some pretty Galentine’s Day decor to really set the tone. 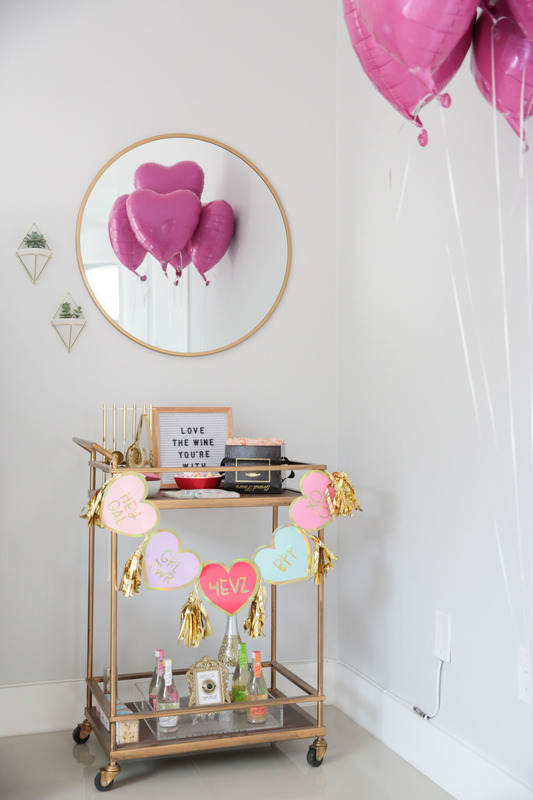 We brought balloons, confetti, yummy treats, coffee table books and more and it made the house so much more… Galentine’s-y (not a word – I know). Even if you’re just spending the day together celebrating the holiday, decor can make or break your mood and also helps get some really cute photos. 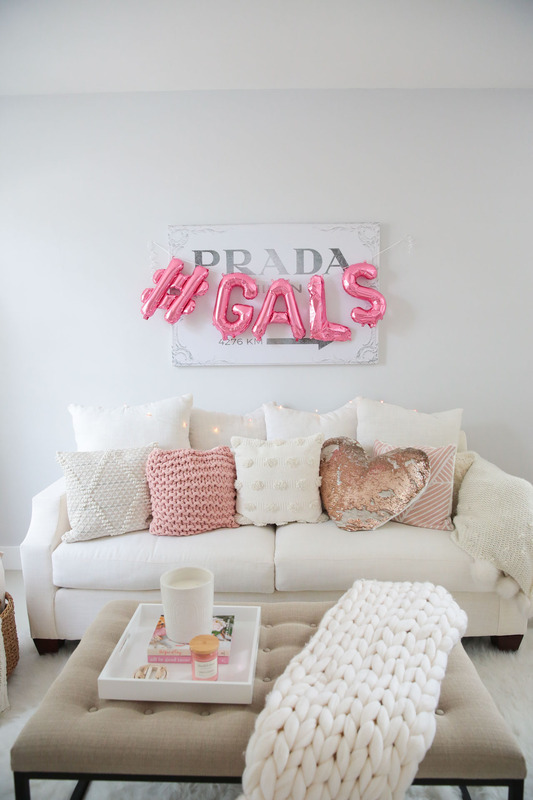 Split up the decor responsibilities amongst you and your friends and soon enough you’ll have a themed Galentine’s Day house! For snacks, we had everything from Hershey’s kisses to Misha’s cupcakes, Jupiter Donuts, Sugarfina snacks, cookies and pizza! It’s safe to say we were all on a sugar high for a while afterwards. What better way to celebrate than with some rosé? 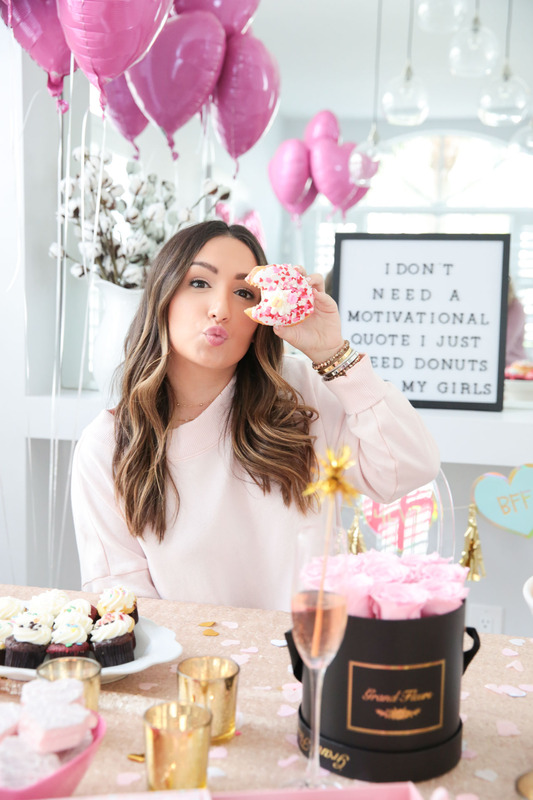 We brought some bottles of bubbly and enjoyed them as we talked about all things blogging, Miami, life and more. It would also be super fun to make some cocktail recipes at home. There are a bunch on Pinterest that are so fun, holiday-themed and easy to follow. 3. 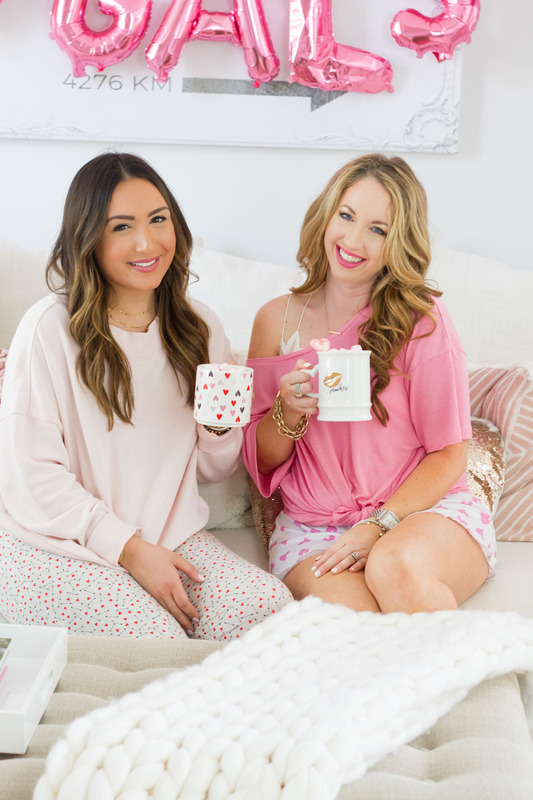 Wear cozy pink or Galentine’s Day-themed pajamas! 4. Make some hot chocolate in cute themed mugs! I am all about themed mugs… and hot chocolate. Who isn’t?! After you eat, laugh and drink some bubbly, grab a romantic film and watch it while sipping on some hot chocolate with pink marshmallows! This is a great time for everyone to relax and calm down from a sugar high and who doesn’t love romantic movies?! 5. 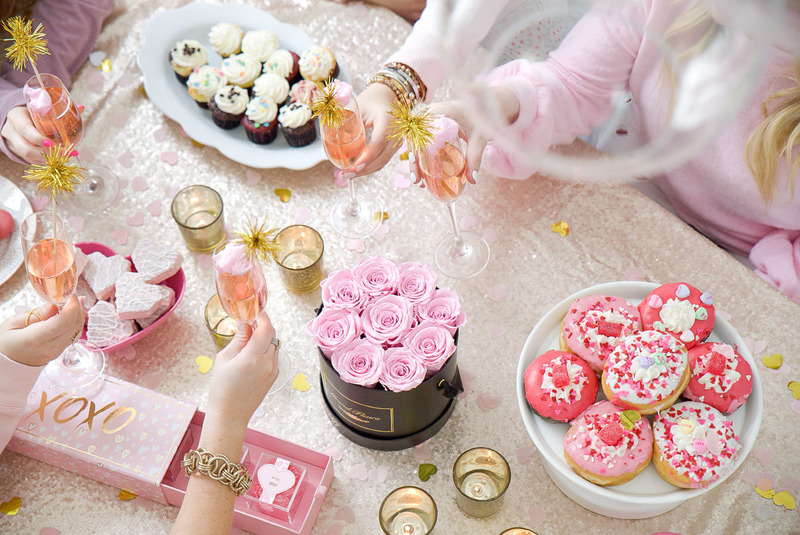 Spend Galentine’s Day with friends whose company you enjoy! Make this a day about appreciating friendship, celebrating love, eating too many sweets and laughing until your stomach hurts. 6. Eat all the donuts. You can go back to the gym tomorrow. Seriously, OBSESSED! Love all the decor & mostly all the yummy treats.. my fave! 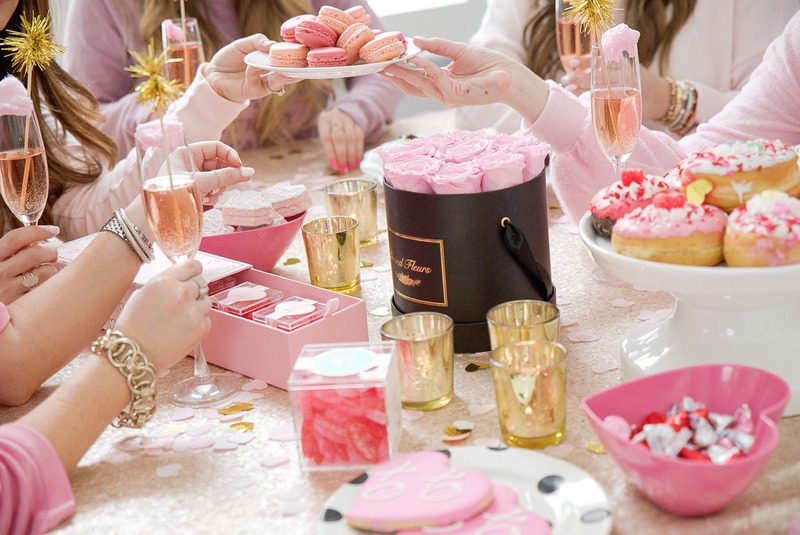 Such a great idea to throw a Galentine’s party and just enjoy each others company. You girls are all looking so comfy and gorgeous as well. Happy Wednesday! 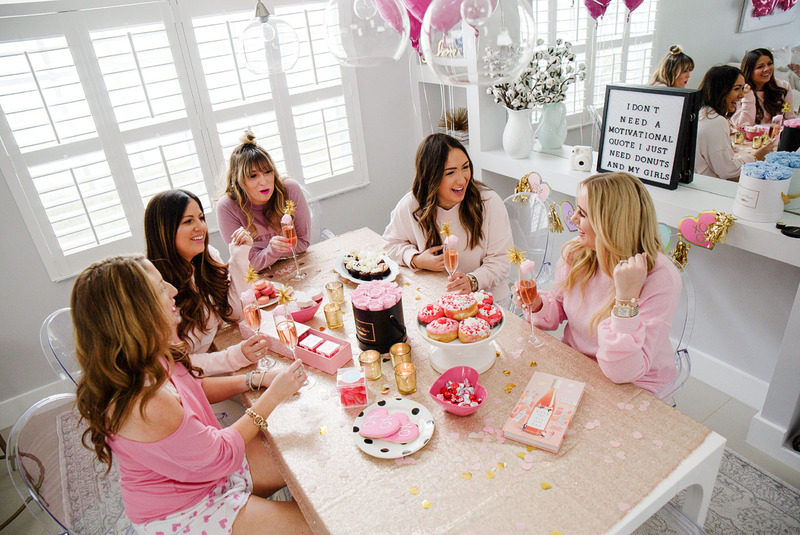 I love the idea of the Galentine’s party! It’s such a fun way to get with the girls, and I am loving the cozy feeling. The decor is so cute and I love all of the colors too. How fun! I wish I could eat everything on that table! Those marshmallows in your hot cocoas are so cute too!! What a fun idea! and what wonderful ladies to have a party with! I want all the donuts please!! I love this post! You girls are so cute! Wow, you guys are so adorable. 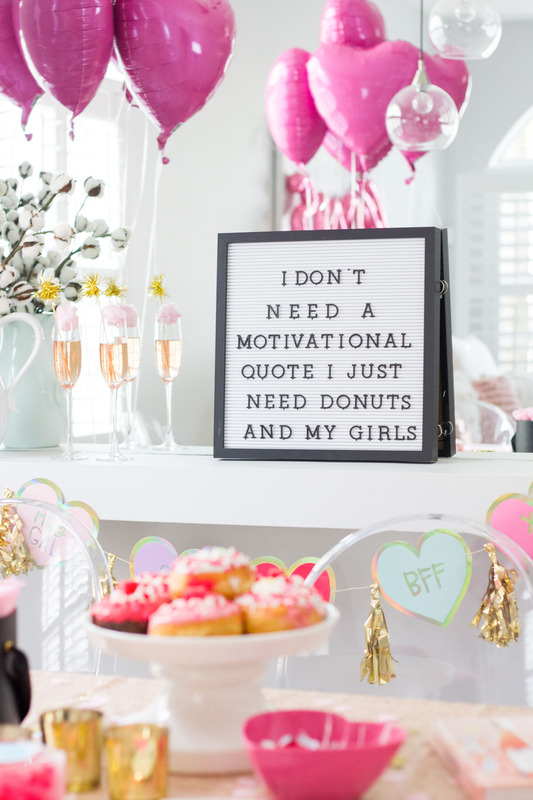 I really want those donuts and pretty much all of your Galentine’s Day decor. OKAY, WHAT?! 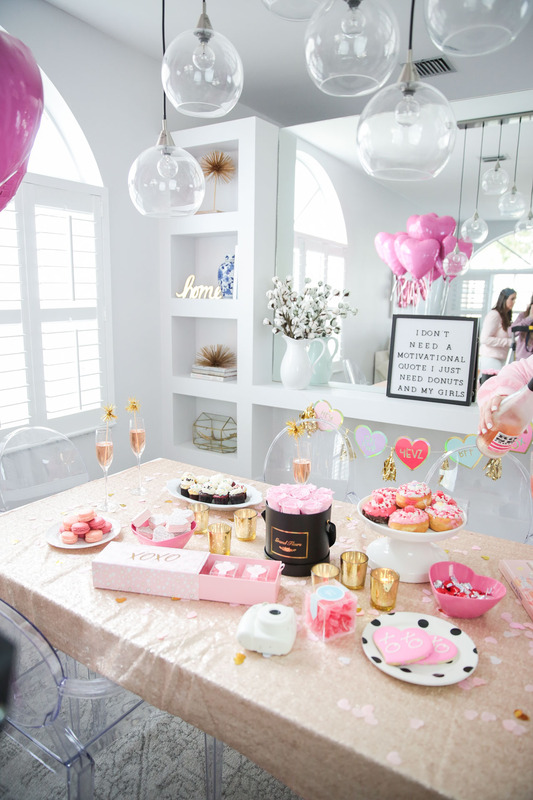 Why do we not live closer so that I could attend this adorable party?! You nailed it. What a fun time!! These photos are beautiful and that spread was to die for!! Yall look amazing!! I wanna be there!! Omg how cute is this?! I love this!! Looks like so much fun babe. Such a cute & fun post! Love all the pics! What a gorgeous set up!! And I love all of y’all’s cozy outfits! I’ll take one of each, please .. oh and one of those delicious donuts! This came out adorable!!! You girls did a great job!!! I AM SO IN LOVE WITH THIS POST! 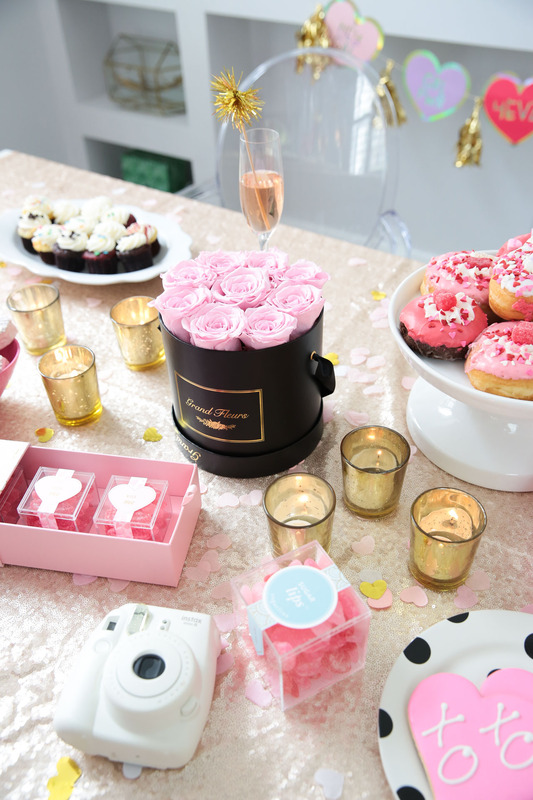 I SO WANT TO PLAN A GALENTINE PARTY TOO AFTER THIS POST! Looks fun and cute! Love it!